With its quirky design and playful colours, this one-bedroom villa in Kerobokan is about as Instagram-perfect as it gets. Located in a quiet spot between the hipster vibes of Canggu and the glamour and glitz of Seminyak, Villa Madah is the perfect romantic getaway or honeymoon hideout. The villa is built in traditional Javanese joglo-style. Its very steep roof is supported by solid wooden beams and provides plenty of natural air flow. The colorfully designed living and dining space is perfect for snuggling up, and its old-style colonial charm comes out even more at night thanks to the retro furniture and the subtle indoor lighting. The sofa has a mosquito net and can double up as an extra bed if necessary. 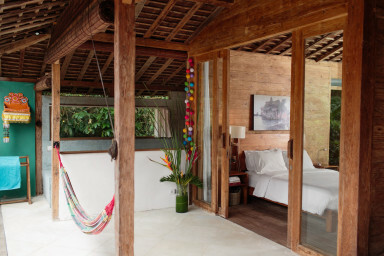 The living quarters open up to a lush tropical garden and a private swimming pool. The walls provide for plenty of privacy, but if you really want to turn up the charm levels by a notch or two, we’d advise you to open the hatches and enjoy the wonderful views over the neighbouring rice fields. Whether you’re topping up your tan on one of the sunbeds or swinging back a freshly-made cocktail from your hammock – this really is outdoor living at its best. The air conditioned bedroom is very bright and has a comfortable quuen-size mattress. It comes with plenty of storage and a semi-outdoors ensuite bathroom with bathtub, toilet and separate shower. There’s an additional guest toilet by the entrance. The fully equipped kitchen has all mod cons, including a large fridge freezer. We’d very much recommend you let our private chef take care of the cooking instead, so you can focus on fully enjoying your holiday. At an additional cost she’ll prepare you the most delicious daily breakfasts, lunches and/or dinners. She’ll also gladly throw in a little masterclass in Indonesian cooking – perfect if you want to impress the crowd back home. Highly recommend. You will not be disappointed.